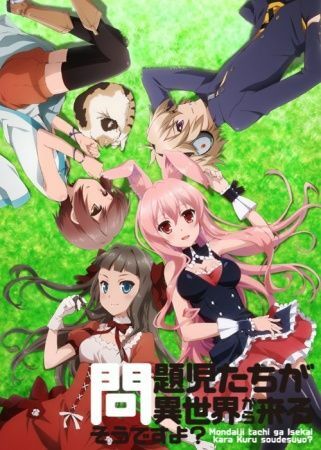 Izayoi Sakamaki, Asuka Kudou, and You Kasukabe are extraordinary teenagers who are blessed with psychic powers but completely fed up with their disproportionately mundane lives—until, unexpectedly, each of them receives a strange envelope containing an invitation to a mysterious place known as Little Garden. Inexplicably dropped into a vast new world, the trio is greeted by Kurousagi, who explains that they have been given a once-in-a-lifetime chance to participate in special high-stakes games using their abilities. In order to take part, however, they must first join a community. Learning that Kurousagi's community "No Names" has lost its official status and bountiful land due to their defeat at the hands of a demon lord, the group sets off to help reclaim their new home's dignity, eager to protect its residents and explore the excitement that Little Garden has to offer. English: Problem children are coming from another world, aren't they? Synonyms: Mondaiji-tachi ga Isekai kara Kuru Sou Desu yo?